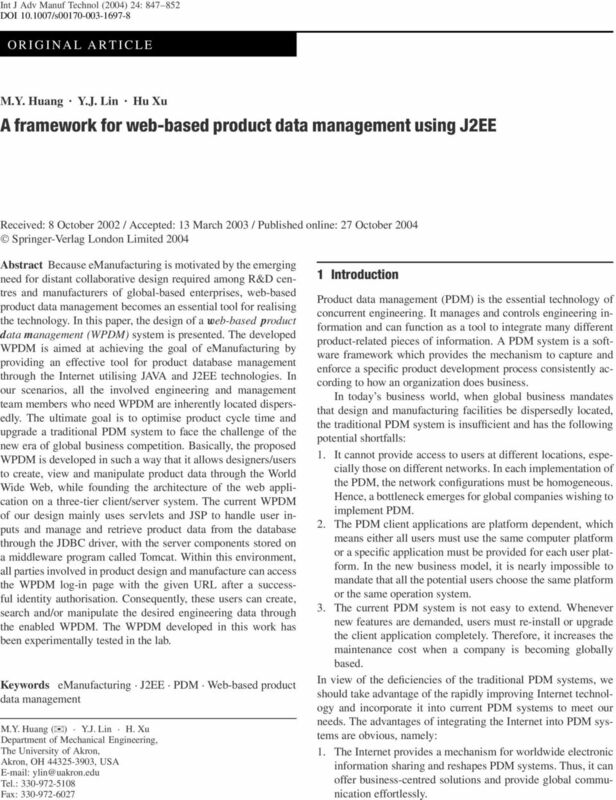 Download "A framework for web-based product data management using J2EE"
1 Int J Adv Manuf Technol (2004) 24: DOI /s ORIGINAL ARTICLE M.Y. Huang Y.J. 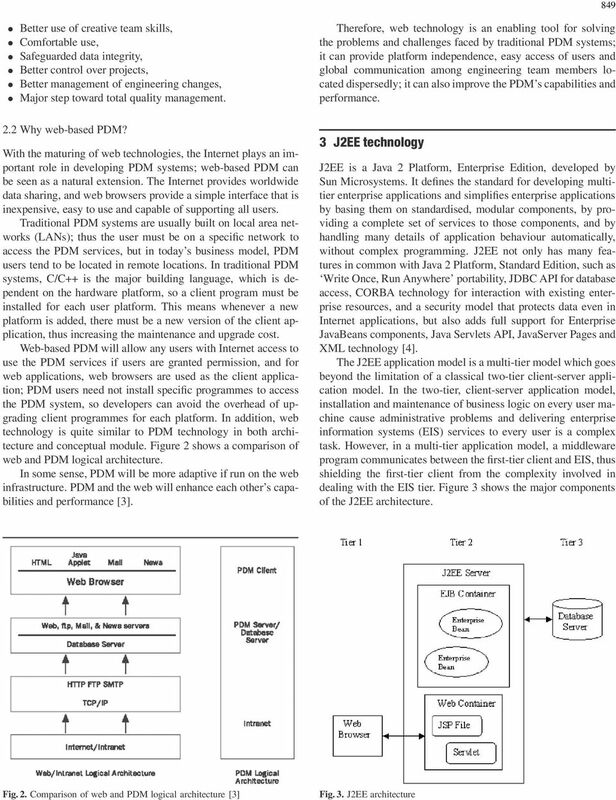 Lin Hu Xu A framework for web-based product data management using J2EE Received: 8 October 2002 / Accepted: 13 March 2003 / Published online: 27 October 2004 Springer-Verlag London Limited 2004 Abstract Because emanufacturing is motivated by the emerging need for distant collaborative design required among R&D centres and manufacturers of global-based enterprises, web-based product data management becomes an essential tool for realising the technology. 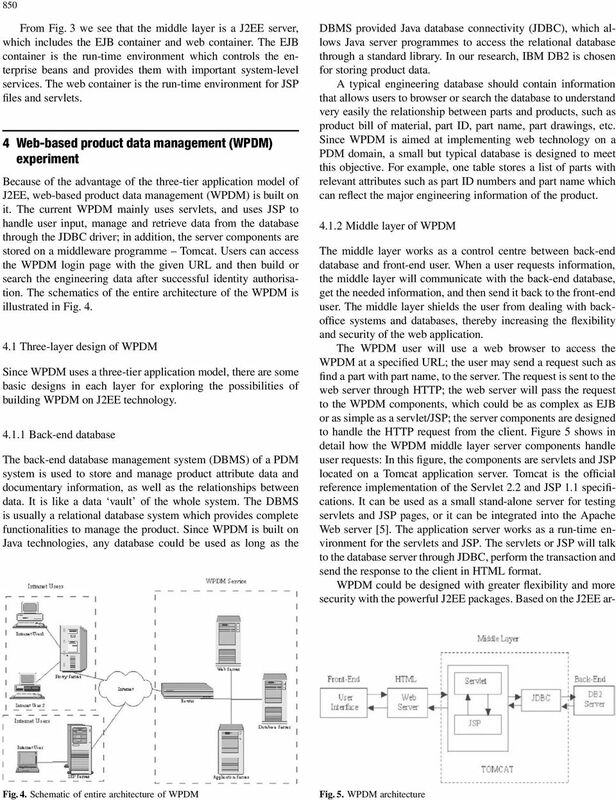 In this paper, the design of a web-based product data management (WPDM) system is presented. The developed WPDM is aimed at achieving the goal of emanufacturing by providing an effective tool for product database management through the Internet utilising JAVA and J2EE technologies. In our scenarios, all the involved engineering and management team members who need WPDM are inherently located dispersedly. The ultimate goal is to optimise product cycle time and upgrade a traditional PDM system to face the challenge of the new era of global business competition. Basically, the proposed WPDM is developed in such a way that it allows designers/users to create, view and manipulate product data through the World Wide Web, while founding the architecture of the web application on a three-tier client/server system. The current WPDM of our design mainly uses servlets and JSP to handle user inputs and manage and retrieve product data from the database through the JDBC driver, with the server components stored on a middleware program called Tomcat. Within this environment, all parties involved in product design and manufacture can access the WPDM log-in page with the given URL after a successful identity authorisation. 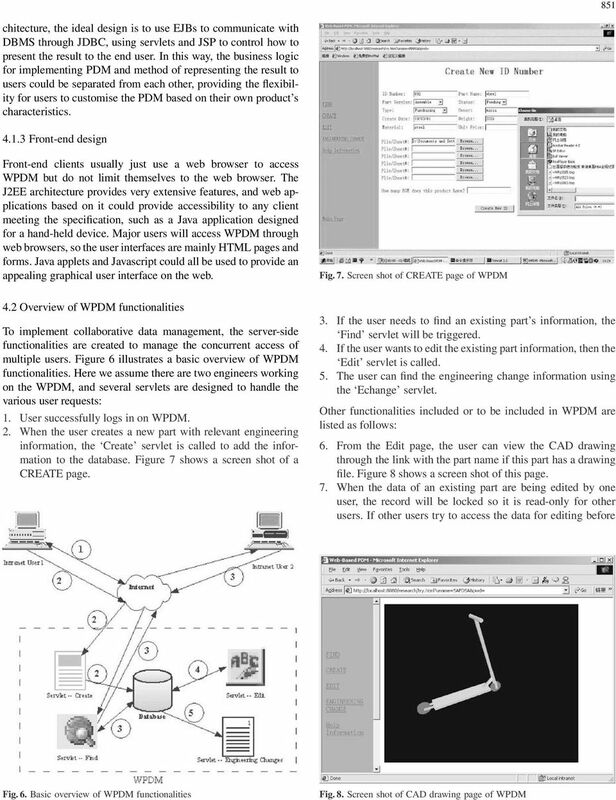 Consequently, these users can create, search and/or manipulate the desired engineering data through the enabled WPDM. The WPDM developed in this work has been experimentally tested in the lab. Keywords emanufacturing J2EE PDM Web-based product data management M.Y. Huang ( ) Y.J. Lin H. Xu Department of Mechanical Engineering, The University of Akron, Akron, OH , USA Tel. 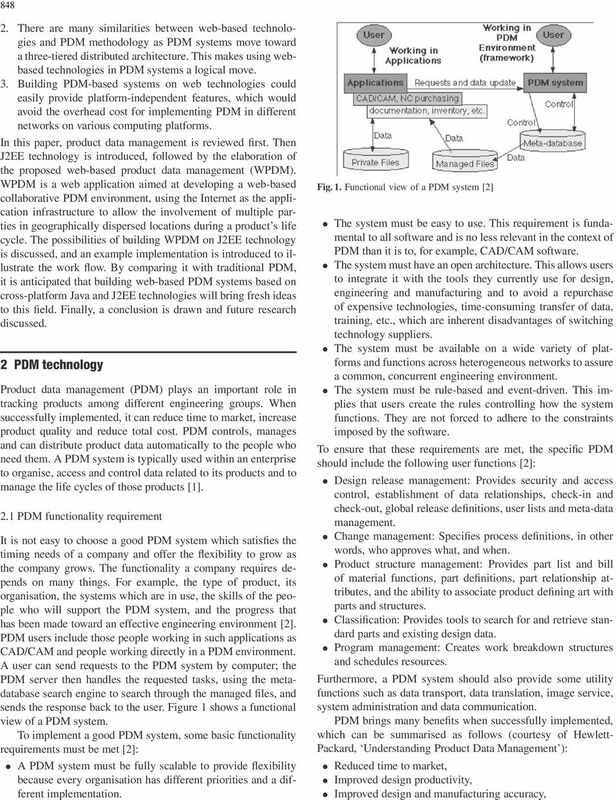 : Fax: Introduction Product data management (PDM) is the essential technology of concurrent engineering. It manages and controls engineering information and can function as a tool to integrate many different product-related pieces of information. A PDM system is a software framework which provides the mechanism to capture and enforce a specific product development process consistently according to how an organization does business. In today s business world, when global business mandates that design and manufacturing facilities be dispersedly located, the traditional PDM system is insufficient and has the following potential shortfalls: 1. It cannot provide access to users at different locations, especially those on different networks. In each implementation of the PDM, the network configurations must be homogeneous. Hence, a bottleneck emerges for global companies wishing to implement PDM. 2. The PDM client applications are platform dependent, which means either all users must use the same computer platform or a specific application must be provided for each user platform. In the new business model, it is nearly impossible to mandate that all the potential users choose the same platform or the same operation system. 3. The current PDM system is not easy to extend. Whenever new features are demanded, users must re-install or upgrade the client application completely. Therefore, it increases the maintenance cost when a company is becoming globally based. In view of the deficiencies of the traditional PDM systems, we should take advantage of the rapidly improving Internet technology and incorporate it into current PDM systems to meet our needs. The advantages of integrating the Internet into PDM systems are obvious, namely: 1. The Internet provides a mechanism for worldwide electronic information sharing and reshapes PDM systems. Thus, it can offer business-centred solutions and provide global communication effortlessly. E-Commerce Supply Chain Management Domain Research and Standard Architectures Kunal Chopra, Jeff Elrod, Bill Glenn, Barry Jones. Java 2 Platform, Enterprise Edition (J2EE) Bruno Souza Java Technologist, Sun Microsystems, Inc.